March 15-27, Fairhope, Al. Booth 5522 on Fairhope Ave.
April 26-28 Magic City Art Connection, B’ham, Al. This is the last of the small work available. Tomorrow I will try and find the next size up, $225 and $275, and post them. All the small work previously posted today has been sold. This has been a pretty sucky couple of days. Hurricane Florence has chased me away from my first fall show, Arts in the Heart of Augusta (Ga.). So, I’m taking this time to do something I’ve been meaning to do for a while anyway; post pictures of new work and include some older work too. If you all see anything you love, for the days shown above only, I will give you a 10% discount and pay for the shipping too. 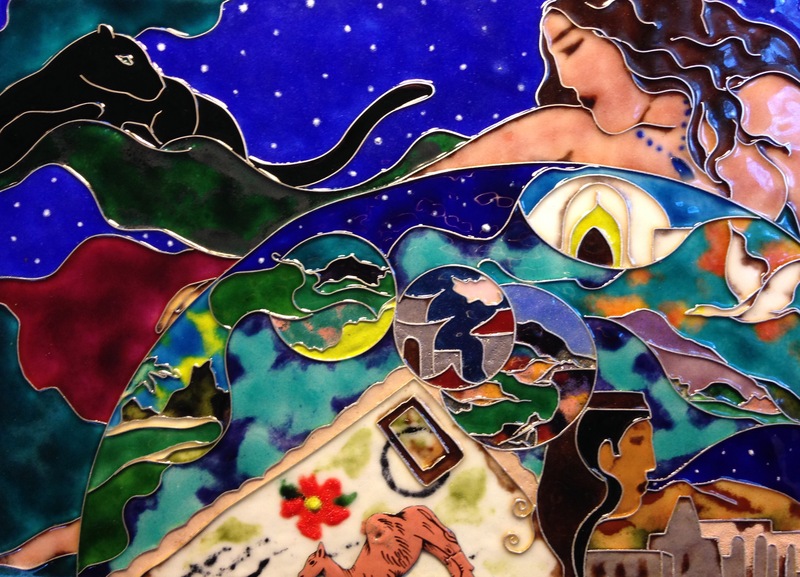 The vertical images are 4×8″ enamels $375 (less 10% or $337.50). The birch (white) trees is a 6×6″ enamel in a 12×12 frame and is $450 (less 10% is $425). 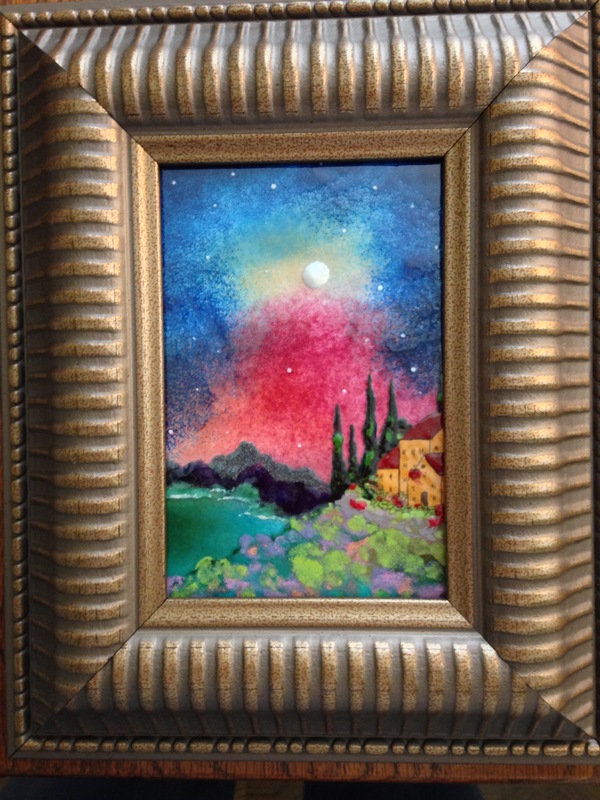 The snow scene is 8×8″ and has a gold frame (no mat) and is $525 (less 10% or $472.50). The two small enamels are $125 each (less 10% or $112.50). 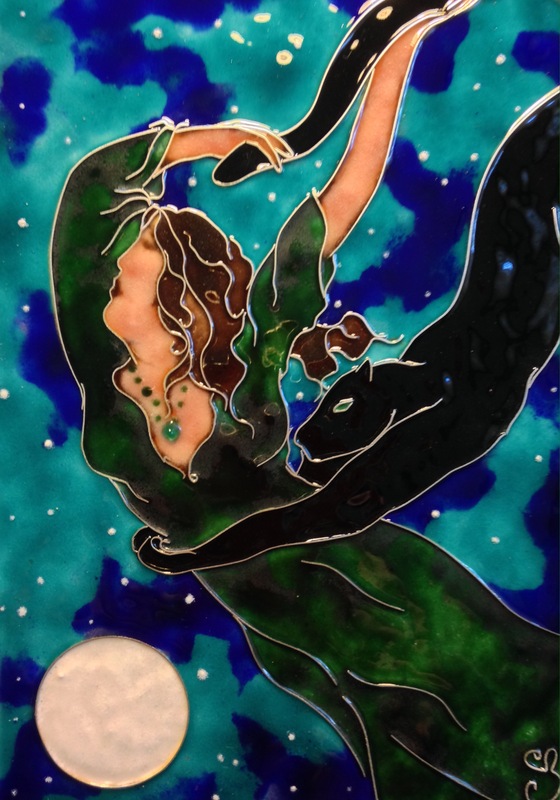 The cloisonné of “Sisters Sharing Secrets With the Moon” is $975 (less 10% or 877.50). And, with all, I’ll pay the shipping. Message me below or text (850) 573-4433 if you have questions or would like to see additional work. As always, if you have questions, please contact me at (850) 573-4433 (preferably text me). Thanks, and I hope to see you all this fall with tons of new work. These two are just the first that are finished; lots and lots more coming. Didn’t get what you wanted for the holidays? Today is December 29th, the fifth day of Christmas. Below are two cloisonne and several new enamels. Until January 5th (the 12th day of Christmas), you may take ten percent (10%) off of any piece and I will pay for shipping. Please text me at (850) 573-4433, or leave a msg. below.